Golden Milk is a drink that originated in India. It is a blend of warm spices that start with turmeric. The blend of spices have powerful anti inflammatory properties. Chronic inflammation is thought to play a role in chronic diseases such as Alzheimer's and cancer. Diets that consist of anti inflammatory compounds are thought to potentially help prevent certain chronic diseases. This is a dry powder mix of fresh ground, all natural & pesticide free ingredients. It is packaged in a variety of sizes. 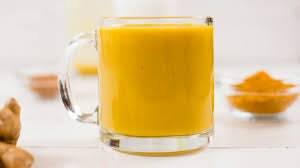 To create the Golden Milk add a teaspoon of the powder mix to 6oz of the milk of your choice that has been warmed to a comfortable temperature for you to drink. Whisk the mix into the milk and enjoy. You can also froth the milk if you prefer a thicker creamier consistency. Enjoy before bed to potentially aid in a good night's sleep. I will ship the least expensive and most secure way. If you have a shipping preference please message me and we will discuss cost. I will ship internationally. Please message me and I will work on a shipping quote for you. There are no refunds unless the item you receive is not the item you ordered. Damages are the responsibility of the shipping carrier as I package the items for shipping very securely. Custom items can be created. Just message me with the info and I will get back to you with details.